Washington, DC – The Institute of Museum and Library Services (IMLS), in collaboration with the Joan Ganz Cooney Center and E-Line Media announced today the winners of the 2016 National STEM Video Game Challenge. The 24 middle school and high school students were recognized at an awards ceremony at National Geographic in Washington, DC. The top original video games and game design concepts were selected in18 categories from nearly 3,000 entries. The STEM Challenge aims to motivate interest in science, technology, engineering, and math (STEM) among youth by transforming their natural passions for playing video games into designing and creating their own video games. The Institute of Museum and Library Services has been a proud sponsor of the STEM Challenge since 2013 as part of its commitment to advance innovation, learning and civic engagement. This year IMLS sponsored more than 20 workshops at libraries and museums nationwide for students and mentors, including a series at the Glazer Children’s Museum in Tampa, Florida, where 16-year-old Kimberly Do was inspired to create the high school winning game design document. 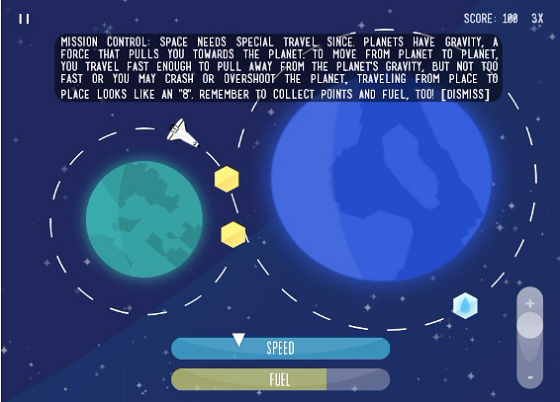 Her game, “Escape Velocity,” invites players to learn the physics behind orbital trajectories and explore space as they attempt to rescue a lost shuttle crew. “I enjoy making art and coding,” Kimberly said. “So it was natural to make video games because it felt like an intersection between the two contrasting fields.” She plans to study computer science in college, and is interested in pursuing a career in UX/UI design. Each winner receives a cash prize of $1,000, as well as a subscription to Gamestar Mechanic from E-Line Media and Curiosity Boxes from Vsauce. STEM Challenge winners also can designate $2,000 to a school or non-profit organization as an institutional award recipient. For more information on each of the winners and their video game designs, please see: stemchallenge.org/press. The National STEM Video Game Challenge was inspired by President Obama’s "Educate to Innovate Campaign." Previous winners have showcased their games at the White House Science Fair, the Smithsonian Institution and Games4Change Festival.